When posting, consider the family-friendly and non-controversial nature of the comic. If you're not sure something is OK to include, feel free to PM a moderator. Please do your best to post legibly and coherently. If you post in a language other than English, please provide a translation. Some people have trouble seeing very bright or small text, so thanks in advance for avoiding those. Also, if you'd like to post on a topic and you're the author of its most recent reply, we ask you to use the edit button on your existing post instead of double-posting. At our discretion, we may remove posts we feel do not contribute to a positive user experience. Accounts which nitpick or post bitter rants about the comic may be suspended. Please do not use the public forum or private message (PM) system to do anything illegal, advertise for other Web sites or chat groups that exist solely to subvert our rules, or subject us to DDoS or other attacks. If you see a post or private message (PM) you think is inappropriate, or which doesn't meet these guidelines, please report it; if you have questions about the rules or moderator activity, please refer to our Rules and Moderator Discussion forum. 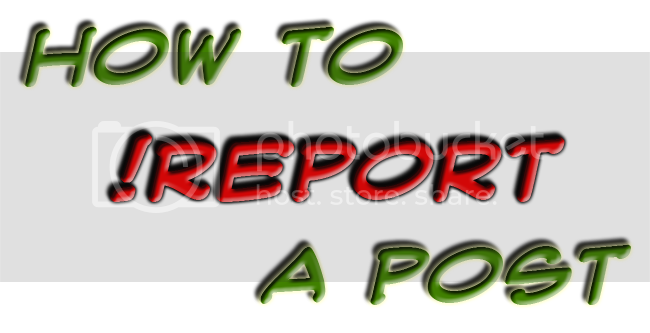 If you see a post that violates one of the forum rules, please submit a report rather than talking about the fact that the post is bad. To do that, find and click on the Report button located in the lower-right corner of the first rule-breaking post. Please do not report more than one post in a single thread; anyone with moderator permissions in the appropriate forum will receive a link to the reported post in their moderator control panel and read through the entire thread from that post onward. Once you have elected to file a report, you will be directed to a report form. Select the most appropriate option from the drop-down box and (if necessary) enter a brief description of why you're reporting the post in the text box. If you select the radio button to be notified when your report is dealt with, you'll receive an automatically-generated e-mail which basically says "Your report is being handled by a moderator or administrator and has been closed. For more information, contact [whichever mod closed the report]." By following this procedure, you'll help us deal with any issues that may arise while simultaneously not mini-modding. Thanks, guys! So what's really new about these rules? They seem pretty similar to me. The only major change is it is now perfectly legal to call Dissension a stupid nut-breath. I'm glad somebody finally said something. Every time I talk to him, I get a craving for cashews. I would never point out the nut-like breath of anyone who's name rhymes with diss-and-shun. Just noticed this topic changed recently. As long as pregnancy fanart isn't creepy, i'm fine with it. It's meant to me to be heartwarming, and these days I would love to see some heartwarming variants. Said fanart is on very thin ice given people's bad habit to fetishize stuff, but if it's clean and proper, then it's fine. I remember the days of Jim-Jim and his habit of not reading the rules beforehand. Hopefully after all this time he went out of his way to read them. Also bump for no reason. How's he been? He used to be a real jerk. Well isn't that rather mean, Sleet. But Sleet is telling the truth. If Stripe said that nobody likes him, then nobody likes him. ... he's also a dork. Whoa-ho-ho hey what. Jim-Jim? me? This is uncalled for, when did i ever troll? Hmm? I just stuck to myself. all i did. i mean sure i asked a few too many questions sometimes but it's just because I got to stubbornly curious. and occasionally someone would yell at me then i would refresh the page and everything would just... disappear. and get a private message. WELL FINE, I'M GOING. AND I'M NEVER COMING BACK. Hey, guys, this is just a tiny, tiny revision, pertaining only to the third bullet point. The change is indicated below, in addition to being updated in this thread's first post. Please post intelligently and coherently; we communicate entirely via text, so it is important to minimize ambiguity. Please do not submit one-word or single-image posts or use "chat speak." You also should not double post or submit images or unbroken lines of text that "stretch" the page. Please post intelligently and coherently; we communicate entirely via text, so it is important to minimize ambiguity. Please do not submit one-word or single-image posts that are off-topic or do not contribute to the conversation. We also ask you do not use "chat speak," double post, or submit images or unbroken lines of text that "stretch" the page. Aww, you ruin all the fun! if they didn't then they wouldn't be mods! Our job is to make sure the forum is as unfun as possible, you see. There aren't really a ton of loopholes. The current rules are a more condensed form of an older version I authored. We now allow far more of those than we used to - you'll note that, in the old version, all single-image and one-word responses that were not part of a forum game were excluded. I calld him something worse. No, not only worse. I called him the worst! The worst thing someone could anyone else, ever. I KNEW they were conspiring against me! We don't need any help for that. We also ask you do not use "chat speak"
Does this include the use of lol, rofl, brb, atm, etc. Or is this rule referring to the overuse of this in silly statements or practices such as replacing letters for numbers within words, e.g. N00b!!1!. Although I'm guessing this is even allowed (within reason) in a certain familiar forum game? Yes those are discouraged. Just spell out your words, por favor. well, lol and rofl can be effectively replaced by emoticons, and brb really doesn't have a use in a forum where immediate replies aren't expected. ATMs can't talk, let alone conect to the internet. Why do you demand this things from them? Did it now? I'm flattered! I originally found Housepets! through recommendations from other web comics and discussions. These recommendations included favourable comments about the HP community and one of many reasons why I joined the forum. Just dropping by to make sure everything is all square. Thank you for keeping the forums fun to poke around! Just dropped by to read the new rules. They are pretty good to my point of view. Now I know for sure what I can and cannot do. The following rule was updated; additions are indicated with bold, italicized text. Please post intelligently and coherently; we communicate entirely via text, so it is important to minimize ambiguity. If you feel the need to post in a language other than English, please provide an English translation of your comments; others should not need to visit an external Web site to understand what you're saying. Please do not submit one-word or single-image posts that are off-topic or do not contribute to the conversation. We also ask you do not use "chat speak," double post, or submit images or unbroken lines of text that "stretch" the page.